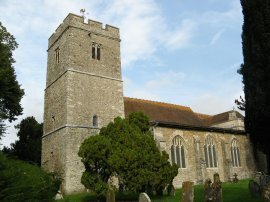 I did this walk on Sunday 31st August, just over two months since my last walk along the North Downs Way. I left home at 7:00am and had made good time for the 8:21 from Hollingbourne to Maidstone East, from where I brought a very pleasant ham and cheese crossiant from the station cafe. 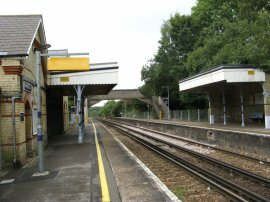 From there I had been planning to take the footbridge over the Medway to Maidstone Barracks Station for the train to Cuxton but the footbridge was closed for resurfacing and thus I had to detour down to the road bridge over the river which was closer to the charming Maidstone West Station. The through ticket cost £4.70. 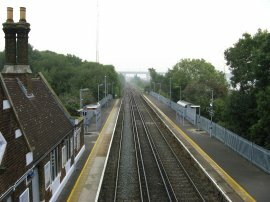 It had been very foggy when I had left London although this had lifted slightly when I reached the North Downs however as I got the train in Hollingbourne it had started to spit with rain. Arriving at Cuxton Station, photo 1, it was 0.7 of a mile back to where I had finished the last stage of my walk along the North Downs Way by the Ranscombe farm car park. The path from Cuxton was a bit overgrown in places and my trousers soon got soaked by light rain that had fallen on the greenery although by now the rain had stopped. It was a very still day with no wind and quite humid. 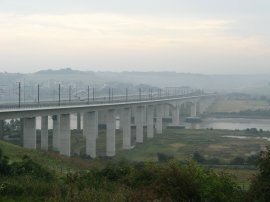 From the car park I headed along the A228 over the M2 before taking a footpath off to the right that leads down to the Medway Bridge, photo 2, for the high level crossing over the Medway alongside the motorway and channel tunnel rail link. I had driven over the bridge so many times and was really looking forward to walking over it. Crossing the bridge I could see bits of weed drifting lazily upstream on the slowly incoming tide far below. 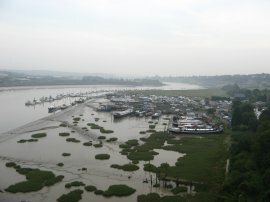 Looking downstream, photo 3, I could just make out the towers of Rochester Cathedral and the Rochester bridge over the river. Leaving the bridge the North Downs Way links up with the route of the Medway Valley Walk along a stretch of path I had walked earlier in the year. The path turns to the right down a road, crossing back underneath the motorway before taking a driveway off to the left that runs down to the building by Nashenden Farm. At the farm the route turns to right and starts heading uphill back onto the North Downs. 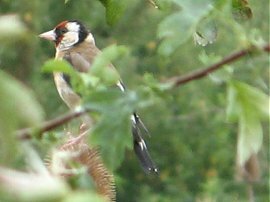 Just before the farm I spotted a Goldfinch on a bush, photo 4, a bird I had been trying to get a decent photo of for ages. The path heads between some houses and over the Channel Tunnel Rail link and then runs alongside fields on a chalky path, photo 5, ascending steadily uphill, passing the Shoulder of Mutton Wood as good views opened up over the river Medway, although they would have been far better if it had not been so misty. On the way I passed a tent in the corner of a field and wondered if it belonged to someone who was walking along the North Downs Way, this was the first time I had come across someone camping besides the path. 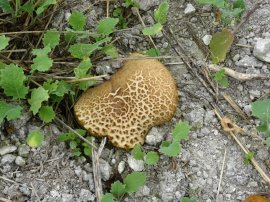 In the fields besides the path I saw a number of large brown mushrooms growing just above the soil, photo 6. 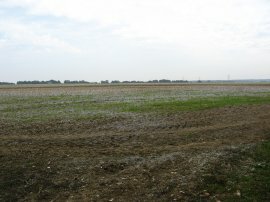 The route leaves the fields, and the route of the Medway Valley Walk, and then continues ahead along a fairly stony tree lined track, the trees rather cutting down on any views over the Medway Valley. This long and fairly straight section of path, which continues to head gently uphill, eventually joins a minor road, Common Road, before continuing on towards Blue Belll Hill. 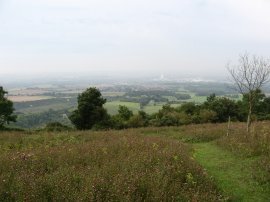 Eventually the route takes a path off to the left into the Burham Down nature reserve by the Bluebell Hill Picnic site where once again there were hazy views across the Medway Valley, photo 7, the path having now reached a height of some 580ft. 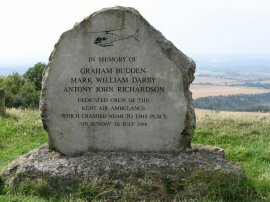 In the car par is a memorial to the Kent Air Ambulance crew, photo 8, that had died in a crash nearby in 1998. from the picnic site the North Downs Way runs through a small path of trees before turning right along a tarmac footpath that runs downhill parallel with the A229. Eventually this leads down to a road where the route continues ahead for a short distance before taking a footpath off on the right. This path descend down a few steps and then heads downhill along hedge lined track which leads past the burial mound at Kit's Coty House, photo 9, which are the remains of a Neolithic chambered long barrow. From Kit's Coty the path continues heading quite steeply downhill along a hedge lined track. Crossing a road the route joins a byway that runs along to take a Toblerone shaped tunnel under the A229. Leaving the underpass the route passes round the back of petrol station, takes a bridge over the channel tunnel rail link and starts heading back uphill through Boxley Warren Nature Reserve. In places the route climbed very steeply uphill including a flight of steps, the first of several that I would encounter during the day. Heading uphill the path passes another standing stone, the White Horse Stone, photo 25. As I was heading up the hill I passed another group of tents including one particularly large one that was over the footpath, accompanied by a couple of teenagers sitting round a camp fire. 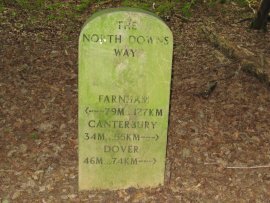 A little further up the hill I then passed another of the concrete North Downs Way distance markers, photo 10, this one said that I was now 79 miles from Farnham with 46 to go to Dover. Reaching the top of hill by Westfield Wood the path turns to the right running along the edge of the woodland with wide open views over the fields on top of the downs to the left, photo 11. The path runs along the field edge next to the wood before passing under some electricity pylons which were really crackling in the still air. 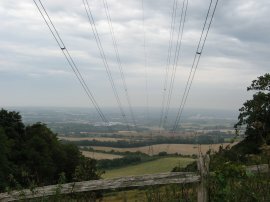 Looking down hill towards the M20 and Maidstone, the wires looked almost as if they belonged to a cable car, photo 12. Just past the pylons the route turns to the right and takes a footpath that runs through the trees, just below the edge of the field. The path skirts round the edge of some barns at Harp Farm and continues along over road and along the edge of a field. The route soon crosses another road and continues ahead through another patch of trees at Boxley Wood, once again just away from the edge of the fields on the top of the downs. 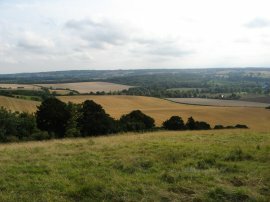 When I was living near Maidstone I once went out with a girl who lived in Gillingham and this was the road that I used to take on my old Honda SS50, which barely had the power to climb up the North Downs from Boxley. 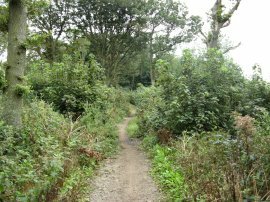 After a long straight level section of path through the trees of Boxley Wood, photo 13, the route joins a public byway with its red North Downs Way Markers, photo 14, turning to the right. In this area I had come across a number of posters for three missing dogs and also further on, a missing pygmy goat. 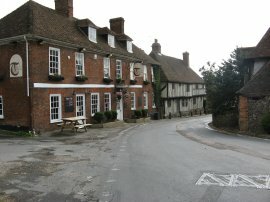 The path heads downhill to join the Pilgrims Way where the North Downs Way turns to the left to pass through the village of Detling. 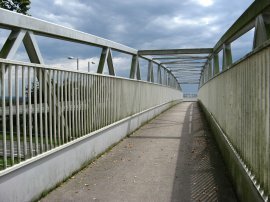 Detling is split into two by the A249 dual carriageway but since 2002 the road has been crossed by a bridge, photo 15, known as Jade's Crossing, built in memory of a young girl and her grandmother who had been run over crossing the road a couple of years earlier. Looking at the volume of traffic on the road as I went over the bridge I'm glad I didn't have to attempt the crossing at road level. Just before I crossed the road I stopped at a bench underneath the bridge and had a quick bite to eat. I had walked about 11 miles from my start point, at a pretty quick pace as it was my wedding anniversary and we were going out for a meal in the evening so I didn't want to be late. Once over the bridge the route continues to follow the Pilgrims Way through the village. 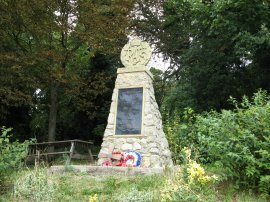 On the way it passes a memorial to those who had served at Detling Airfield, photo 16. 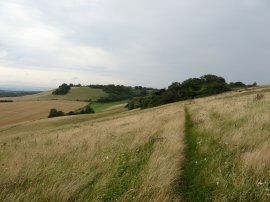 The route leaves the Pilgrims Way turning left uphill besides Detling Cricket Club and climbing quite steeply up towards the top of the downs, photo 17. The path continues ahead for a little way before heading very steeply downhill along a flight of wooden backed steps cut into the chalky soil before immediately having to ascend almost as steeply up the other side of hill, although photo 18 doesn't quite give the perspective of the descent and ascent. 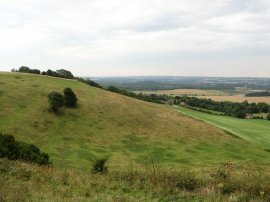 The route crosses below the currently rather treeless White Horse Wood Country Park, which is Kent County Council’s newest country park and apparently over 20,000 trees including oak, ash, silver birch, wild cherry and crab apple have been planted, so the view may one day change. From the top of the hill a number of kites and remote controlled gliders were flying and in the distance I could see a hot air balloon. 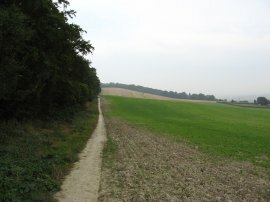 The path joins a road, Castle Hill, and turns right along a road, descending downhill before taking a footpath off to the left at a bend in the road where the route once again start heading uphill, passing near the remains of Thurnham Castle. The path goes round the top of a dry valley, descending over a field that had cows and sheep in it when I went past, before taking another steep flight of steps uphill over what was proving to be a very strenuous section of path. 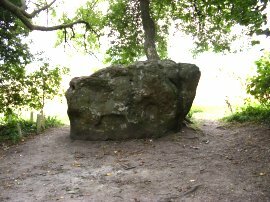 The route crosses Coldblow Lane and heads across the wooded flanks of the downs, heading down and then climbing up yet another flight of steep steps. Reaching an open field by Cat's Mount the path turns left heading back uphill before taking a path that once again runs through trees close to the top of the hill. Leaving the trees the North Downs Way crosses over a grassy field from where photo 19 was taking looking back to Cat's Mount. 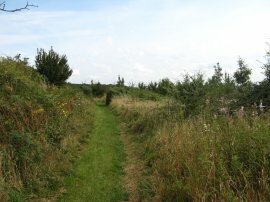 The path then turns up to the left, then continuing right, crossing a minor road and continuing over a pleasant open section of path running along the top of the hill, photo 20. It had been raining for a while but a I was walking along this stretch of path this stopped and also the wind picked up quite strongly for a while which was really pleasant and refreshing, it had been so hot and sticky when it had been completely still. The route reaches a byway and turns left uphill for a short distance besides the Hucking Estate before turning right along another tree lined path along the top of the hill where I encountered a group of pheasants running down the path like a group of road runners. 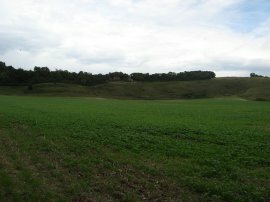 From there it was not much further over the top of the downs, photo 21, before the route began descending grassy slope that leads to the outskirts of Hollingbourne. On the top of the hill I saw four people with four wheel grass skateboards, although they weren't using them when I went by. Reaching a road the route heads downhill for a short distance before turning to the left by the Dirty Habit pub, photo 22, which had a sign in the window from the official receiver stating do not enter. 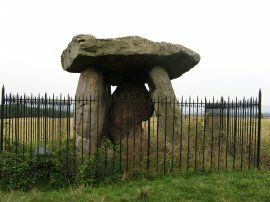 As I was walking past I was stopped by a kid on a bicycle looking for Sittingbourne who wasn't amused when I said it was back over the hill he had just come down! Just past the pub I finished my walk along the North Downs Way for the day, taking a footpath that runs off to the right, down towards Hollingbourne Church, photo 23. From the church I took another footpath that runs back down through the village from where it was just a short walk back to the station, photo 24. Reaching the car the GPS said I had walked 17 miles although I think it was actually nearer 18.25. 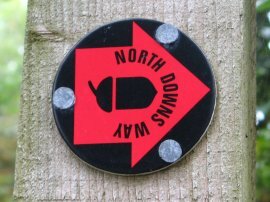 Of the recorded miles 15.4 were along the North Downs Way. I was pleased with the distance I had done and the pace I had kept. I had slowed down considerably after my lunch stop for an hour or so but by the end of the day I was walking at a good pace again.